The results are in, and this year’s Black Friday sales prove that things are continuing to look up for ecommerce. Across 570 online stores, the average store did 2.4 times their normal sales in Black Friday week 2017, compared with only 2.2 times in 2016 – and a greater proportion of stores participated in the sales. 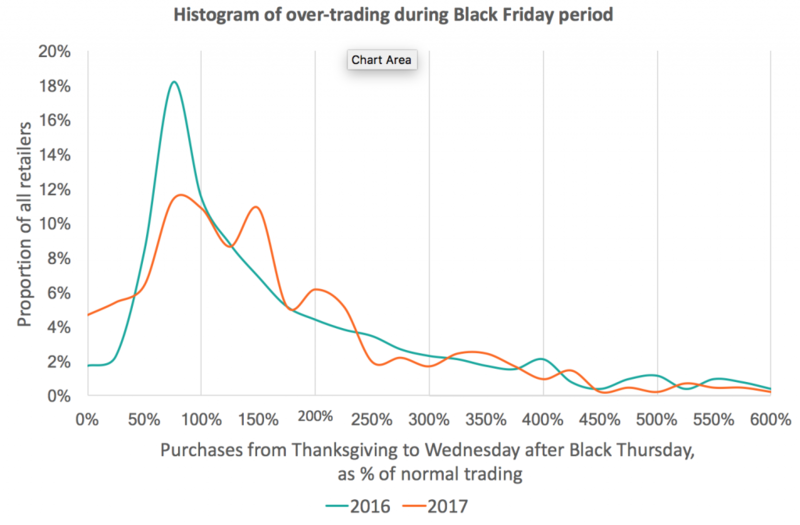 Following our post on pre-Black Friday trends, Littledata looked again at what happened from Thanksgiving Thursday 2017 through to the following Wednesday (the week including Black Friday and Cyber Monday) – versus a control period of November & December in 2016. Compared with 2016, we found a bigger number of stores participating in Black Friday sales this year: 53% of stores were trading more than 1.5 times their normal volumes, compared with only 49% in the equivalent week in 2016. For those stores which promoted heavily in 2016, the median boost was 2.5 times normal. And those in the bottom quartile of sales in 2016 still traded 108% their normal volumes. How did Black Friday promotions work for your store? Use our industry benchmarks to find out how your online store is performing against the competition.